Today’s tutorial was created when I had to come up with a crafty freebie to include with the swag bags for the upcoming Off White Indie Wedding Show. The challenge wasn’t making something cool, it was the fact that I had to make 100 items! For someone who mostly makes one of something, that number seemed overwhelming. So I puttered around my studio brainstorming what in the world I could make one hundred of. 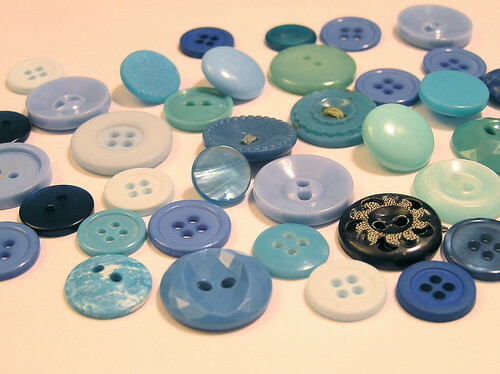 Naturally, I turned to my button and fabric collections, as I have many of these supplies on hand. So then, what to do? Well, brides don’t want a huge bag of cardboard and paper postcards (well, at least I didnt when I went to bridal shows, seemed kind of boring). My light bulb came on in my head, “oooh, something to wear!” I can say that I could have used a tiny little something in my swag bag that I could put on rather than a sticky nametag that says, “bride”. Sorry but stickers don’t make me feel special. But a pretty hairpin does! 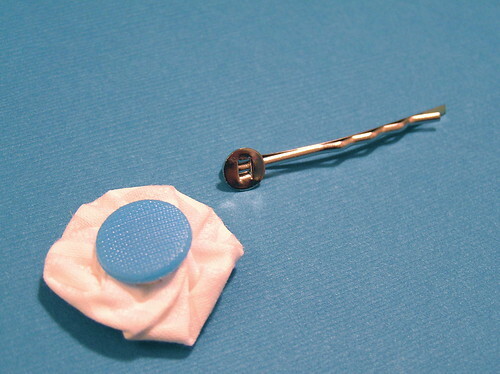 So, I came up with Something Blue hairpins! 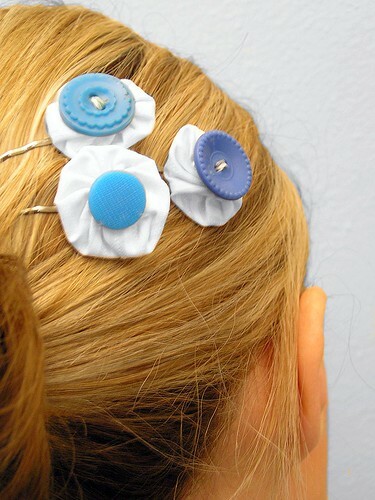 Simple, can be dressed up or down, and adds just a little something (blue) to make a bride or any gal feel special. 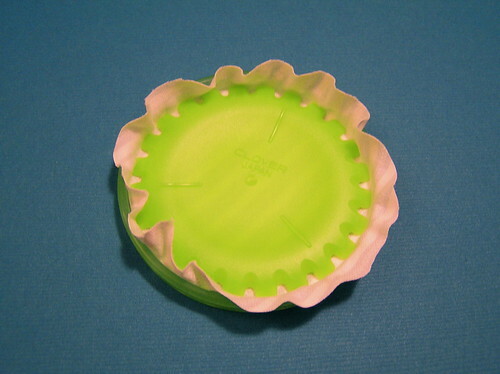 They are quite simple to make, so if you are looking for something new for your ‘do or need to make someone a little gift, here’s a simple and fast project! 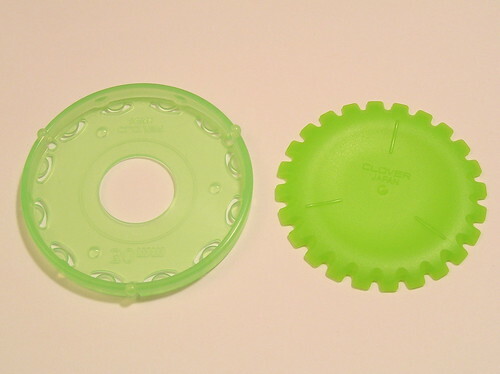 To begin, separate the yo-yo maker. 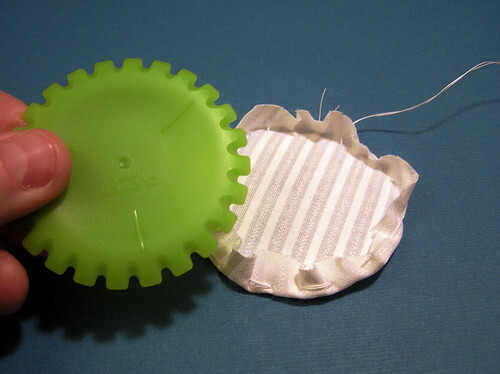 Place the fabric pattern side down into the outer circle of the yo-yo maker. Center the fabric. Press the inner circle into the outer circle, taking care to line up the ‘holes’ of the maker- sometimes it helps me if I hold it up to a light. The circles should easily click into place. Trim around the fabric leaving about a 1/2 inch border to sew on. Thread your needle with twelve inches of thread. Double knot the end. 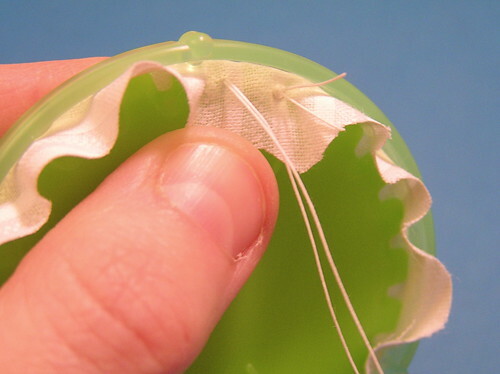 Begin sewing by starting at the fabric border and going through the plastic (this is why its important to line up the holes- if the needle doesnt go through easy, adjust your plastic circles). Bring the next stitch back up to the border- there is a stitch guide to follow on the yo-yo maker. Continue stitching all the way around the circle until you return back to the knot. 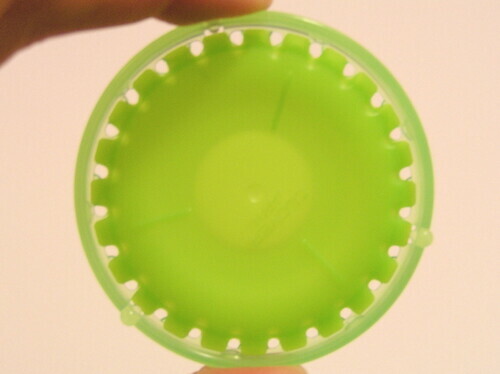 Push the inner circle out with the hole on the backside of the yo-yo maker. It should pop out easily. Remove the inner circle from the fabric. 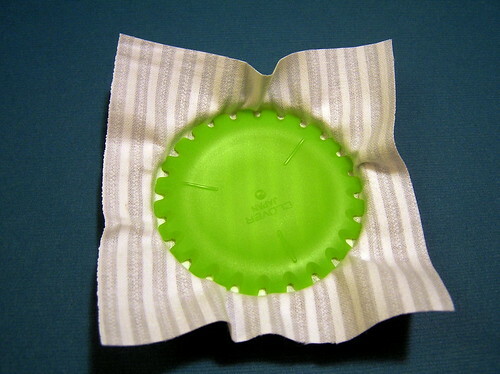 Pull the thread to gather the yo-yo. I find it easiest to insert my thumb in the middle while pulling the thread. 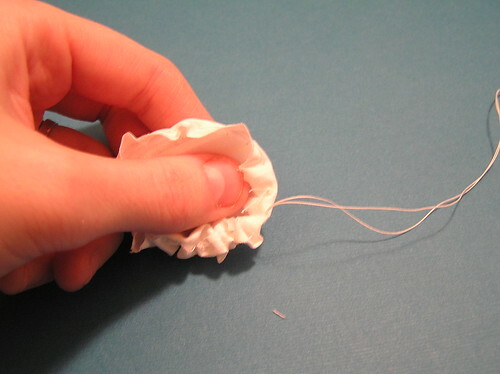 While pulling, you can adjust the fabric until it looks even. 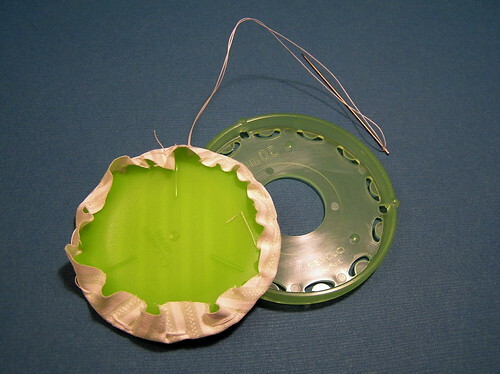 Double knot your stitches on one of the inside folds when the yo-yo looks how you would like. At this point, add your button. 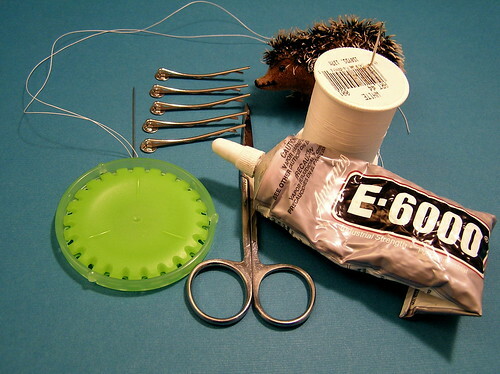 Sew through the shank or holes two to three times. 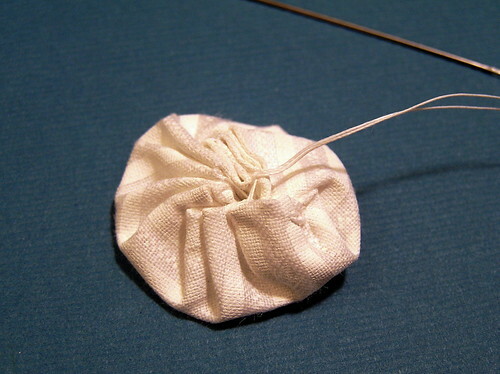 Double knot your stitches on the back and in the middle of the yo-yo. 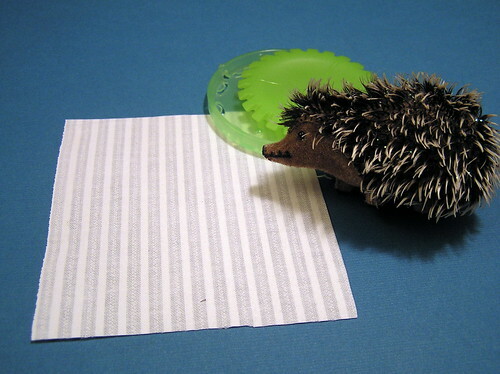 Then add a small dot of glue on the flat plate of the hairpin. 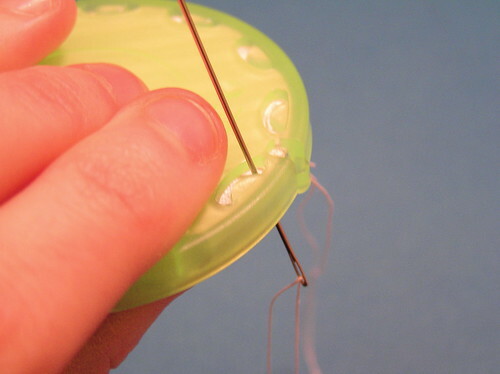 Place the glue on top of the stitches/knot you made on the back of the yo-yo. Lay flat to dry at least an hour before wearing. See how easy that was? You could even try out bigger yo-yos, they come in different shapes too! Check out Clover’s website. Happy Crafting!